Too often our children are overlooked even neglected by parents and sadly by society. This allows them to fall into patterns that are harmful and outright dangerous. If we delay taking action, it will allow them to fall prey to the working of the enemy. We will NOT allow this to take place! Our children are the Lord’s heritage. 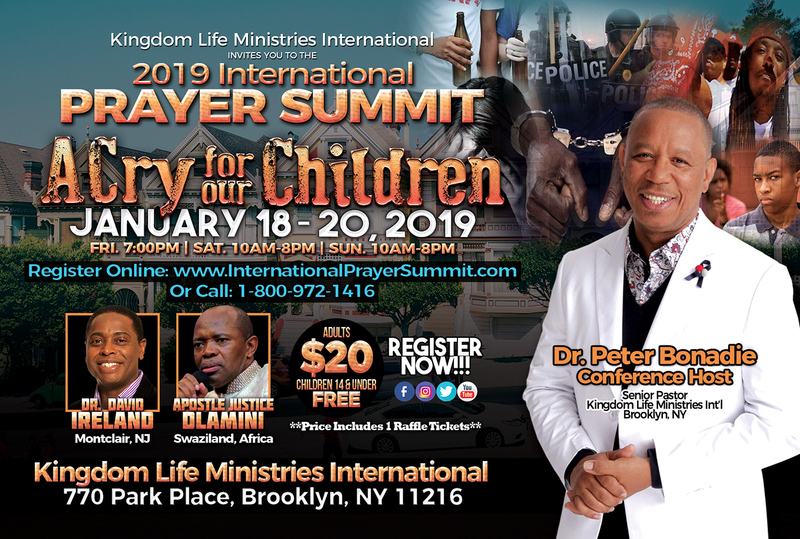 At the International Prayer Summit – January 18 – 20, 2019 we will be covering and shielding the direction and growth of our children. Our theme is “A CRY FOR OUR CHILDREN!” We are taking decisive action in bringing our children before the Lord in prayer to stem and repel the assault on our children! Prepare your heart and mind to receive a word from our host pastors Dr. Peter Bonadie and Pastor Shelly-Ann Bonadie, along with some powerful guest speakers, Apostle John Eckhardt, Dr. David Ireland, and Apostle Justice Dlamini. 770 Park Place, Brooklyn, NY 11216. Each year lives are transformed and a number of reports are received on financial breakthroughs, total healing, the birth of new businesses and tremendous blessings. In 1996 after a season of prayer and intercession the vision to give birth to KLM, located in Brooklyn, New York became evident and this great work began. As the work progressed, Dr. Bonadie trained and raised up intercessors near and abroad. As prayer became a central focus for this house, a consecutive season of deliberate prayer emerged as 48 Hours of Prayer; now one of KLM’s hallmark. This is an incredible way to begin a new year, on your knees, as Dr. Bonadie and his team seek to train and partner with intercessors from around the world. KLM’s International Prayer Summit is known globally!